As a photographer, most people like to travel. It’s nice to get around and shoot places most people don’t get to see. It has been discovered that even those who have lived in Tulsa, OK for 5 years or more may not have seen some of the local sites. With this in mind, I have decided to shoot some local areas and post those sites to my blog. We will start with a very popular park located on 21st street and Peoria. This particular place has a lot of history and should be a “must see” to visitors for many reasons. The scenery is beautiful. The park itself has many areas with which to capture any visitor’s attention. It is conveniently located. It offer 34 acres, designated parking, bathrooms, drinking fountains, plenty of park benches in various areas, picnic tables, covered gazebo, swings for the children, and trails that wind down through a variety of trees, shrubs, and flowers. Woodward park is home to The Tulsa Garden Center. It also has a greenhouse located in back of and across the parking lot of the mansion which houses a few tropical plants and fountains for your educational and/or viewing pleasure. Beside this is the arboretum…which is also a convenient place to walk your dog. “The city of Tulsa purchased a 45-acre tract of land in 1909 for $100 an acre from Herbert Woodward. This area, then called “Perryman’s pasture,” was part of a 160-acre allotment Helen Woodward, a Creek Indian had received from the Five Civilized Tribes Indian Commission. Helen was a minor when her father and guardian, Herbert Woodward, sold the land without her consent. She was fourteen. In 1925 Hellen Woodward Slemp (Mrs. S. H. Slemp) decided to test the sale of her allotment. It became the subject of litigation in the Oklahoma Supreme Court. After four years of court battle, Mrs. Slemp lost her case to the City of Tulsa. The statue is found at the northwest corner of the park near 21st and Peoria and can be viewed as Tulsans and visitors alike pass this way. 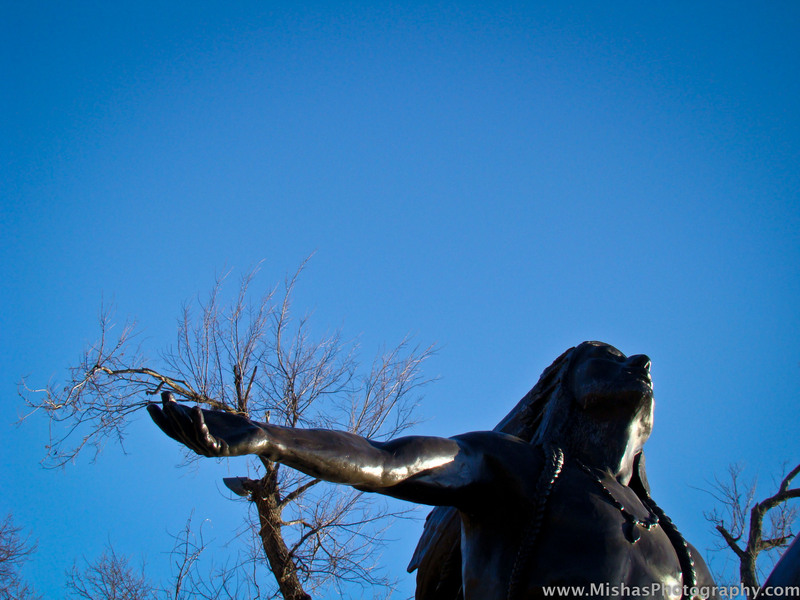 Tulsa’s beautiful Woodward Park offers much to our local residents and visitors alike. It’s the perfect getaway for an hour or a day. You can study nature, relax on a blanket and read or watch the squirrels play, swing high as you did when you were a child and imaginations soared to the sky, or visit the rose garden, the mansion, the arboretum,bird sanctuary, or just go for a run…. The Route 66 Marathon that was ran this past October in 2011 had it’s 5k runners routed through this beautiful park with a band and a water station set up here too. 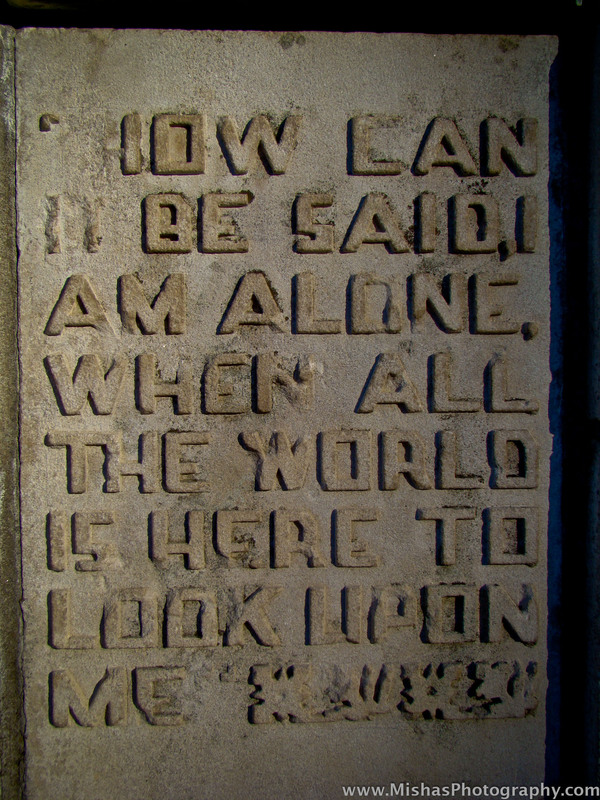 Find this quote from a famous Poet! It’s a beautiful setting in winter, spring, summer, or fall. Watch the daffodils, tulips, irises,roses and the azaelias bloom in the spring…. or watch the leaves fall from the oaks and the squirrels bury their cache….visit the reflection pools, fountains and gardens as often as you can…. you won’t regret it! Outdoor Nature Walk in January! I decided yesterday was such a beautiful day, that I had to be outside. After all, how often in January in the middle of Oklahoma does the temperature reach 70 degrees??!! Well, the weather is known to change on a whim…but the temperatures of the day felt unusual. I used the day to walk the trails at Oxley Nature Center located within Mohawk park area in Tulsa, OK.
opportunities along the trails. This one happened to be on “Coyote Trail”. 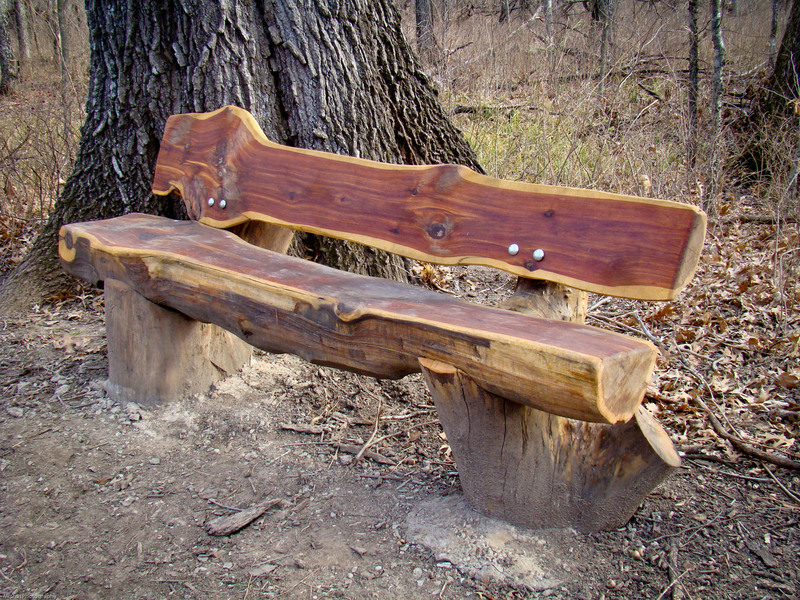 You may think that you have better things to do on a nature walk or hike than sit on a bench…but here in Oxley Nature Center, if you sit quietly for a moment or two, you will see and photograph more than if you just hike or walk the trails. But there is opportunity for whatever your style here (except hunting). Oxley Nature Center is a nature preserve. The photo here is just a good representation of that to me. I was even wearing a red zip-up hoody. Maybe that was a slight contribution to the line of thought. Who knows. While walking, I had the opportunity to observe a herd of deer…count of about 10. They are such beautiful and graceful animals. The birds and their songs are quite varied here and there are marshes and ponds for bird watching as well. If you visit the Blue Heron Trail as I did, there are a few spots with blinds you can sit behind for observing the wildlife as well. It is very peaceful and awe inspiring for any nature lover. 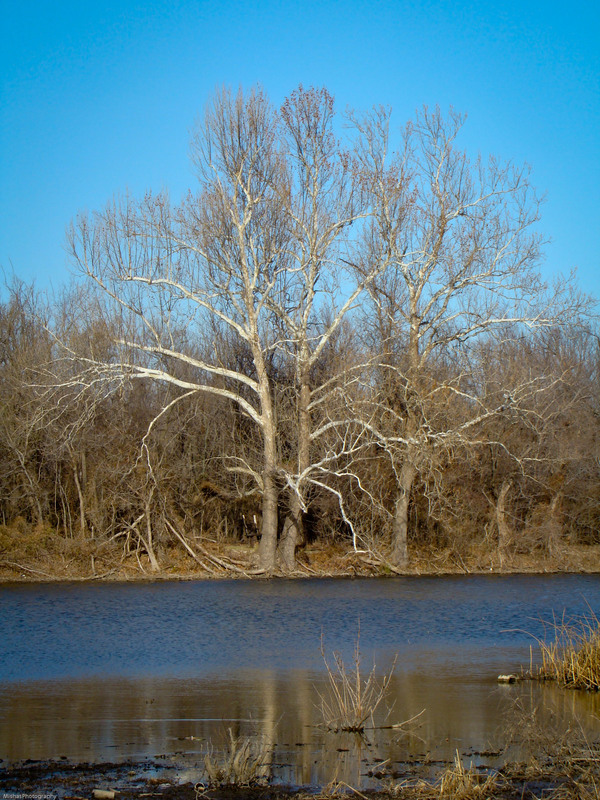 The Tulsa area has many places that offer a wide range of outdoor photography opportunities and hiking too. They aren’t all manicured parks inside the city limits. But they all offer their own unique advantage. Some require travel. But some are nearer to home than you think (if you live in Tulsa, OK). The Oxley Nature Center is located inside Mohawk Park. 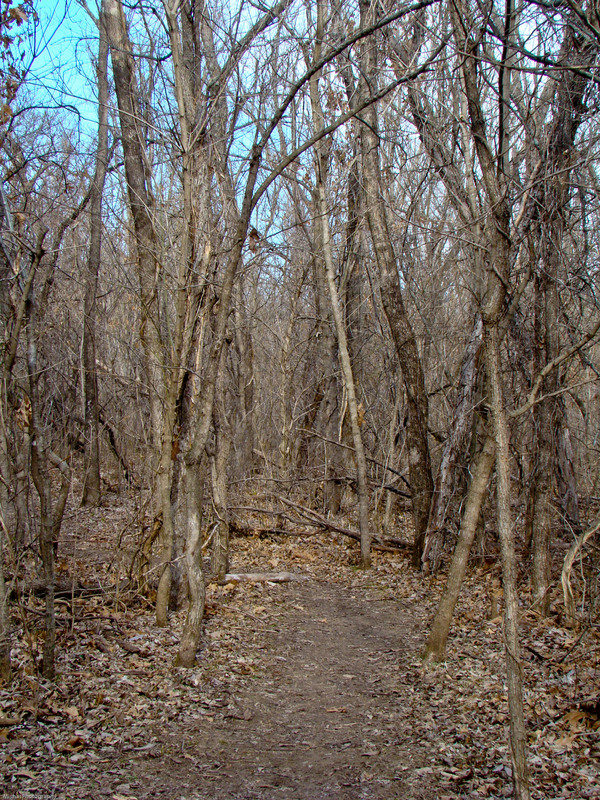 The Redbud Nature Center is another great place with trails and is located near Catoosa, OK just east of Tulsa. I know winter is still here, however outdoor photography is awesome! Spring is coming so keep in mind some of your favorite places and what photo shoot you would like to do this year and CALL US! Find us on FaceBook: www.facebook.com/MishasPhotographyRestoration. This year is still new and you can still decide what YOU want to do with it! Enjoy! Author misha00lowtherPosted on January 17, 2012 Categories photography, etc.1 Comment on Outdoor Nature Walk in January! This year’s open hunt was held in Coweta, OK off of highway 51. The weather was good and the demonstrations were plentiful. If you were there, you had a unique experience. Royal Gauntlet showed a Eurasian Eagle Owl, a Saker Falcon, a Peregrine Falcon, a Great Horned Owl, a few Harris Hawks, a few Red-tailed Hawks, and a couple of flight demonstrations with certain birds. Open Hunt is held each year at the beginning of November. If you missed the 2011 hunt, catch us next year in 2012. Reminders will be announced at the castle of Muskogee’s ren-fair as well as on Royal Gauntlet’s blog. . . . so come to the Castle of Muskogee to see the birds that were at open hunt. The ren-fair is held every weekend in May! 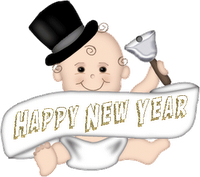 We are FIVE days into the new year leaving 360 days to go…. What will you do with those days?? When all things bloom and pictures are colorful…along with the birds and lil chicks of Easter time….Misha’s Photography would love to schedule appointments for Easter photos taken on location. Do you have a favorite place where you would like photos taken? Let us know. As well as planning for spring and Easter photos, people also set New Years Resolutions at this time of year. Misha’s Photography also has goals for this coming New Year of 2012. To have each client enjoy their photographic experience with us. To share many styles of photography with you here on our blog. To grow our family here at Misha’s Photography. To blog consistently every week this year.